So Armageddon Expo was last weekend! I had a blast and if you went I hope you did too! 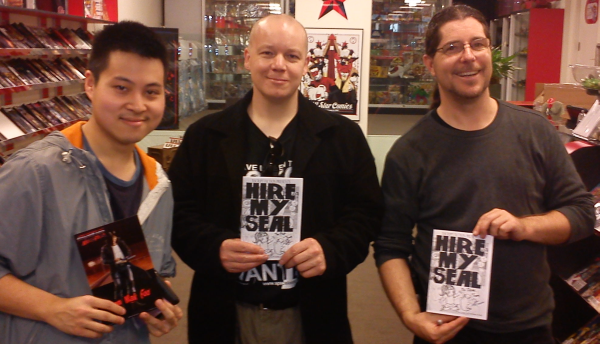 My crew and I handed out over 100 copies of "Hire My Seal" and if you were one of those people thank you for taking a copy! I'd love to hear what you thought of it! Click read on to see all the photos and stories from my weekend! And if you missed out on getting a copy - read on to find out how you can win one! As I am the writer of the "Cosplayer Web Comic" I feel obligated to do some sort of costume making just to get a feel for what Amy Keller goes through. I have to tell you that it is a hard slog getting costumes together and this year I had a group project so I got to design seven different costumes. Here is the result...THE RESERVOIR LEAGUE! I might post more details later on about how I made some of the custom parts but the main idea was suits/formal wear done with a Justice League theme. 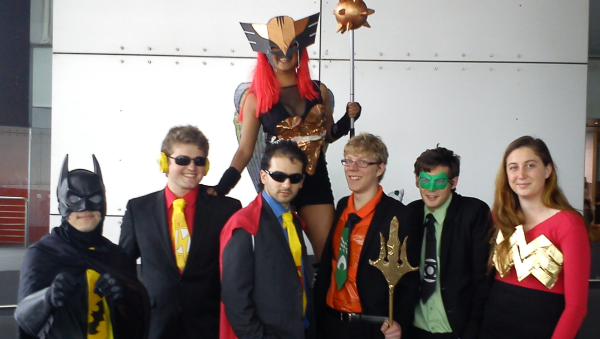 The trident, morningstar, Wonder Woman Breast Plate, Flash and Hawkgirl headgear, and all the ties are made from scratch. You can see the original designs over at my DeviantArt. More importantly, I got to be Batman (mostly to hide my Asian-ness). The highlight of the costumes was a little girl who wanted a photo with me (and though I offered her a shot with the team she declined). Special thanks to my friends for this one, and Kate for taking photos of us. 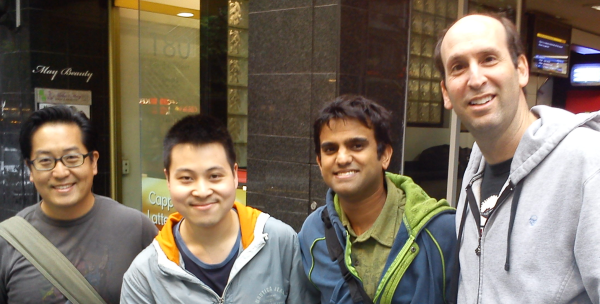 Every year I like to visit Aussie creators Christopher Sequeira and Paul Mason. Chris wasn't at this year's event but I still got to see Paul and get the latest copy of "Soldier Legacy" - a comic you should really check out if you get the chance. Paul has this great flair for writing a story that feels naturally patriotic without having to rub your nose in it. I plan to draw Amy Keller in the Soldier costume very soon. And lo there came a time for the celebrity shots! 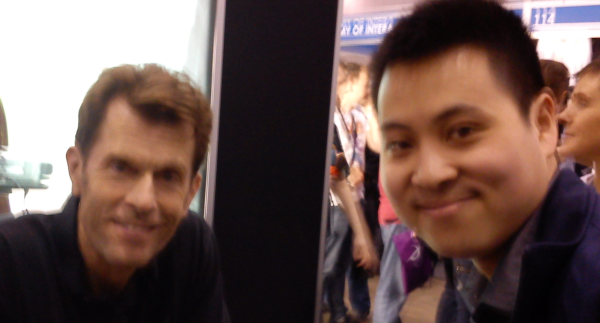 This year I started the line to see Kevin Conroy. The guy was really nice to meet in real life and I got my Batman stuff (including a plushie Batman) signed! Next up was Fred Van Lente who it was a pleasure to meet. And I got to buy his "Comic Book Comics" series directly from him! Of course both of them went home with copies of Hire My Seal. The Monday after the con was also interesting. I got to meet the blokes from Ironclad Imagineers at All Star Comics, who were on their way back to Adelaide (hope the trip went smoothly!) 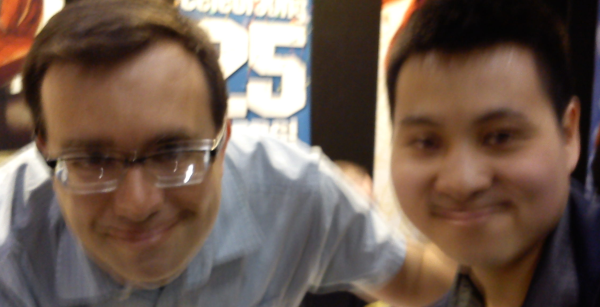 Then afterwards I bumped in to Frank Cho and Zaboo and Vork from "The Guild" outside a Hungry Jacks! All in all a great weekend! Also if you missed out on getting "Hire My Seal" head on over and "like" Xscript Fiction's Facebook page where just by commenting in the "War of the Cosplayers" contest, you go in to the draw to win copies of "Hire My Seal", "Ninja Vampire" and the only printed copy of the first year of Cosplayer strips. Well that's me done until Supanova!